Friend or foe? A proper introduction to the dandelion just might find you in a life-long friendship with one of the most nutritional plants on the planet. It turns out that the whole plant is edible. Their sunny, yellow flowers are most commonly used in making dandelion wine and jellies. Dip the flowers in batter to make dandelion fritters or place them whole right into any sandwich. Dandelion greens can be eaten either raw or cooked. Harvest the greens from a younger plant before the flowers open and they will be a tender addition to any salad or smoothie. They taste bitter and a little tough with age, but are just fine for braising, steaming, or sautéing. Surprisingly, the roots can be laid out to dry, roasted, and ground to make a fabulous coffee substitute. This friendly plant is not only delicious, but promotes digestion and detoxification along with housing very high levels of iron, copper, potassium, calcium and magnesium. 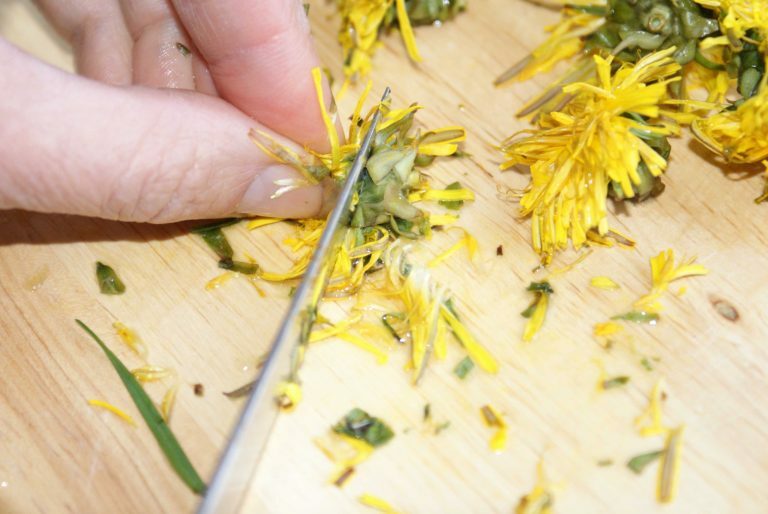 Spring and fall are the best times of the year to forage for dandelions in North America. With over 250 varieties available to choose from, there is no shortage. They are super hardy and have a survivor’s ability to adapt to any landscape. 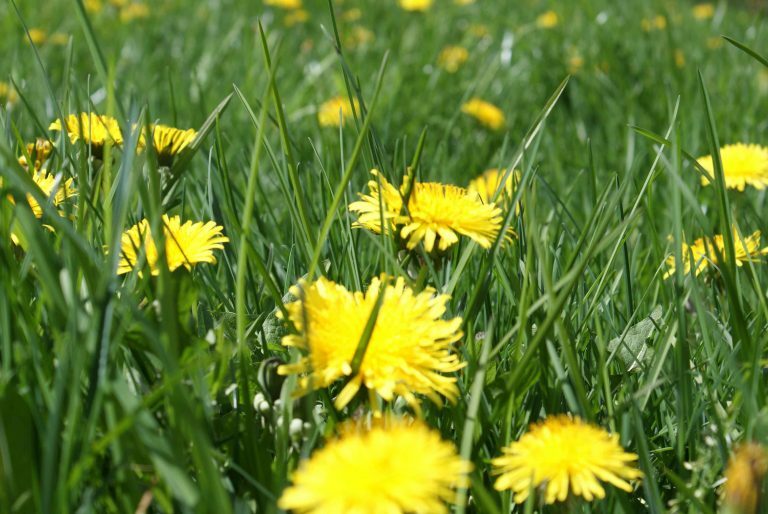 Whether you plant a domesticated version in your garden or search for them in the wild, be careful not to choose dandelions that might be roadside contaminated or sprayed with herbicides. 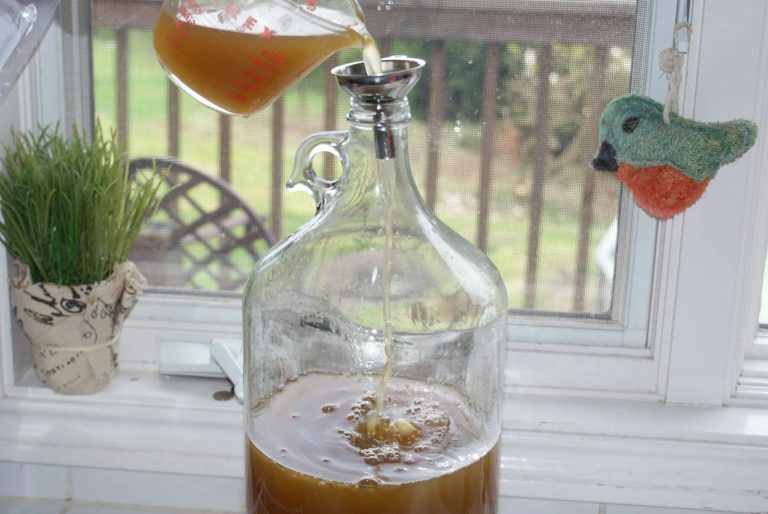 After finding out that dandelion wine takes four to six months to ferment before it’s ready, we figured it would make the perfect Christmas gift and got started. First, we found a lovely field of dandelions that needed picking and got a big enough basket to collect them in. 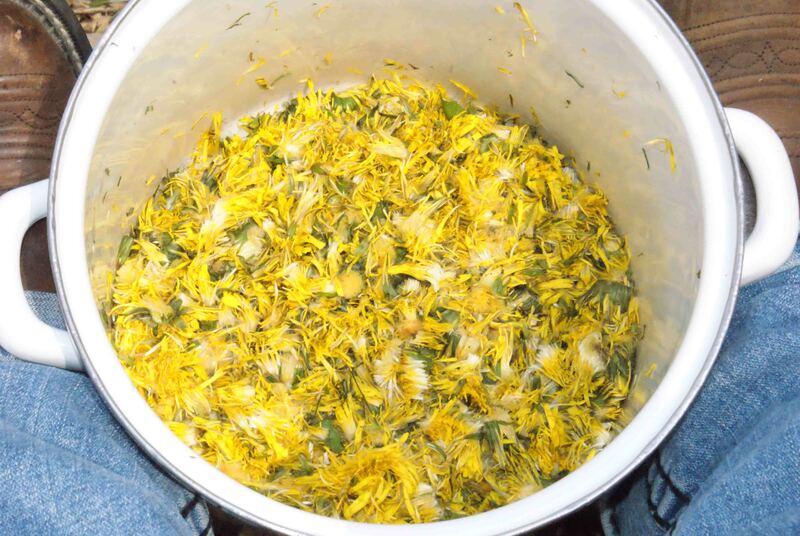 We doubled the recipe (shown below) and realized we had to come up with 16 cups of dandelion flowers. So we started picking. 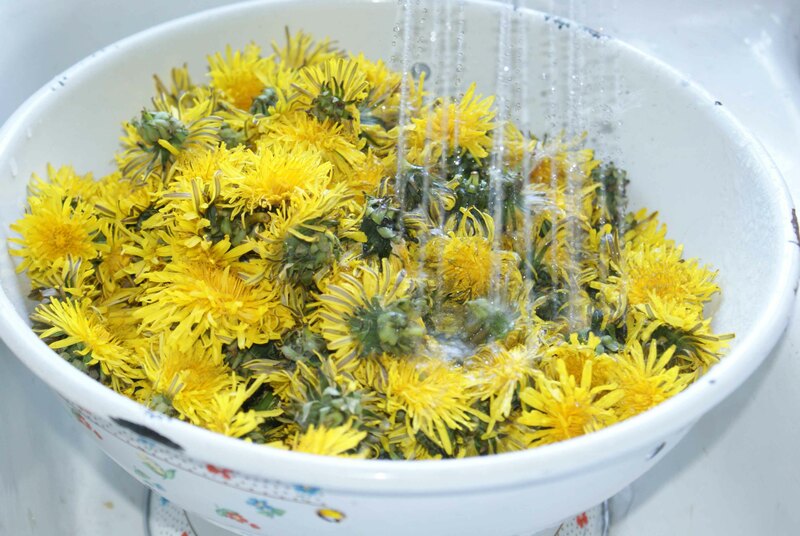 After gathering enough dandelion blossoms to amount to 16 cups, we placed them in a strainer for a good bath. There’s little critters that just love to nestle in for an early morning snack of nectar or a midday nap. We cut the green stems off. This ensures a sweeter wine. It’s okay to leave some of the green stems behind, it becomes extra food for the yeast. We ended up with a nice pot of mostly yellow blossoms. Gorgeous. Next, we boiled two gallons of water (remember we doubled the recipe below) and poured it over the pot of dandelion flowers. Letting this steep for 48 hours is long enough to extract a decent flavor. Some recipes call for 2-4 days. Pick your intensity of flavor. 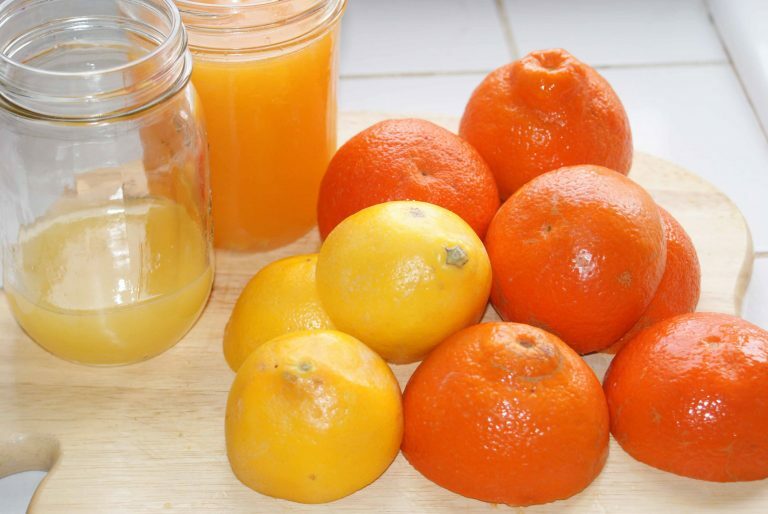 We then cut up two Meyer lemons and four sweet tangelos to juice. We set the juice to the side for later. After placing all the rinds in the brewed pot of dandelion flowers, a robust boil for 30 minutes helped fuse the dandelion brew and citrus together. We ended up with a relatively clear brownish liquid after straining. All the liquid should be pressed out of the remaining mix. This is where we added 12 cups of sugar. That’s a lot of sugar, but the yeast will eat it up and turn it into alcohol. While the liquid was cooling, we took a little ‘walk about’ to the compost pile. A mesh of dandelion flowers, with some lemon and orange rinds mixed in, sure looks pretty on top of a dull pile of compost dirt. We then headed back to our wine and added our yeast which had dissolved in a 1/2 cup of warm water. After giving it all a good mix, we used a measuring cup to pour every last sugary drop into three bottles of various sizes. The fun part was adding ginger and cloves. 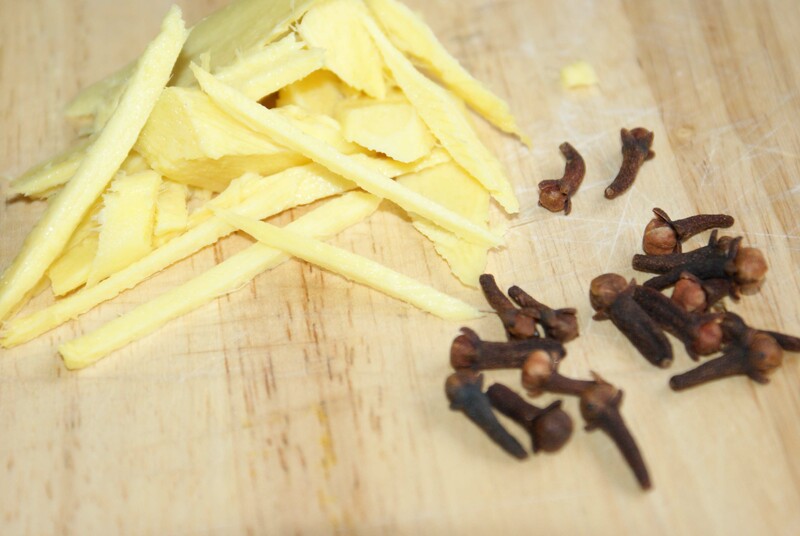 We used 16 cloves and two one-inch pieces of ginger cut into small pieces. 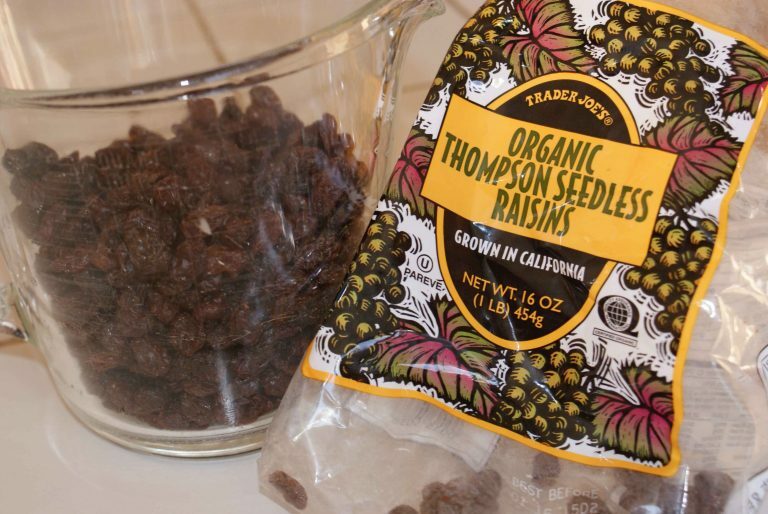 We also added four cups of raisins. All of these ingredients were evenly distributed. We try and use as many organic and/or natural ingredients as possible. We placed a balloon (after poking small holes into it) or a cheesecloth over the top of each bottle. The initial fermentation process will take up to 6-10 days and is best done in a cool, dark place. We put ours in the pantry. When it was done bubbling we strained the liquid through a double layer of cheesecloth to remove any unwanted sediment. Using a funnel to pour the liquid into some used wine bottles, we placed them back into a cool, dark place to continue fermenting for up to 3-6 weeks. How long to let it brew? Feel free to cork at any time. Enjoy in four to six months. 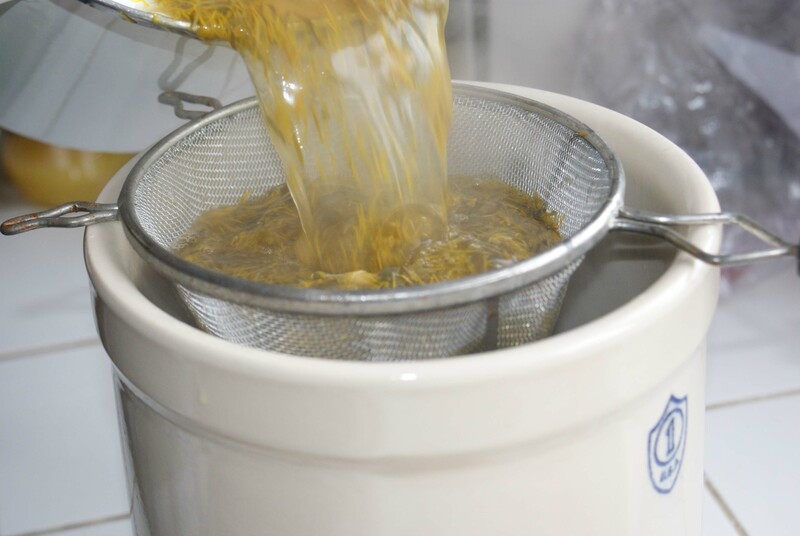 We hope you enjoy making our traditional, old fashioned dandelion wine recipe. It was handed down through three generations of German farmers to a friend of ours. Cheers to sunny sips of dandelion wine this coming winter! The original recipe has been modified to include cloves and and ginger root. We thought it might add some interesting flavors. You can also use ingredients like cinnamon sticks instead of cloves, or cut up figs and dates instead of raisins. Honey can replace sugar. There are also a variety of yeasts that claim their own unique effects on wine. Pick one that works best for you. There are many ways to make this wine. Feel free to get creative and add ingredients to suit your taste. What To Do With Dandelion Wine? Have a “Dandelion Wine Taste Testing” party come Winter Solstice. Your friends will love you for it. 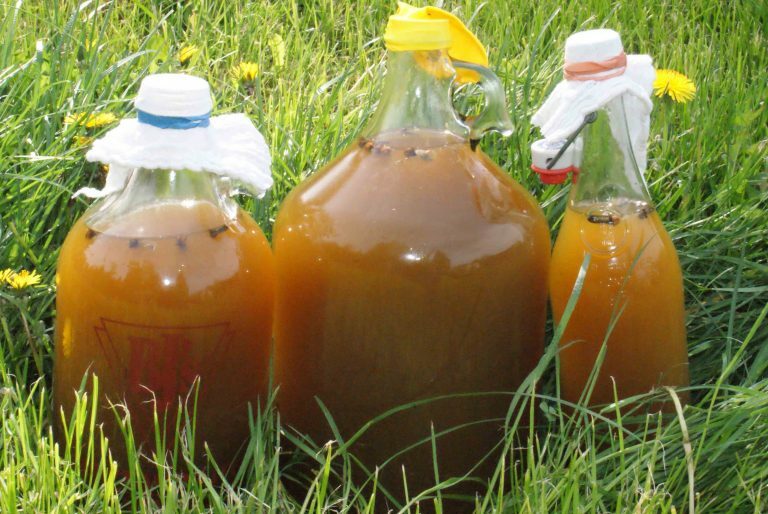 A bottle of homemade dandelion wine makes a perfect Christmas, birthday or hostess gift. Use it in all recipes that call for a sweet dessert wine. Drink it, and with every sip, feel very proud you have made it yourself. 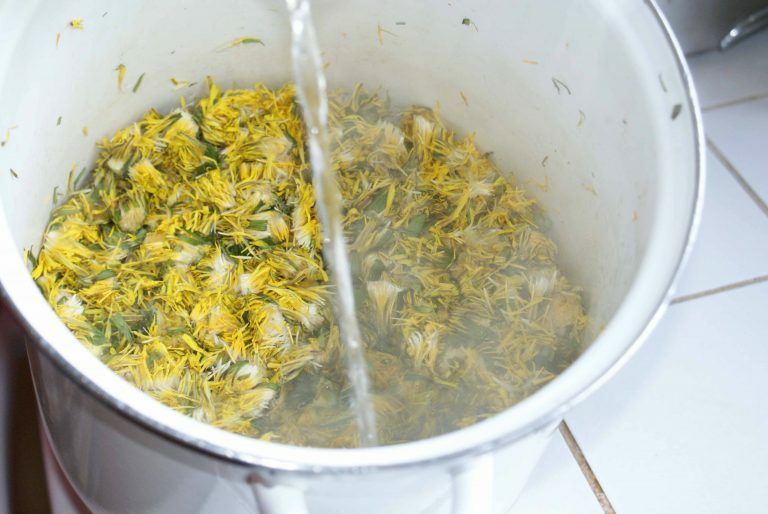 Have you ever tried making dandelion wine before? 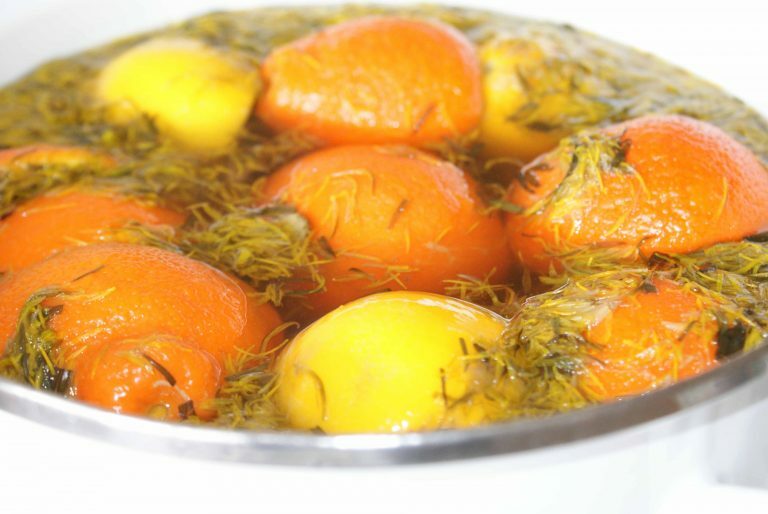 Maybe, you have an old dandelion wine recipe tucked away in a drawer, that you would like to share. Post it in our comments section. We would love to try it.